A painting elephant, a bird that boogies, a whistling ape and more. As people, they'd be more impressive than many. That they're animals will blow you away. These crowd-pleasing critters do everything: They dance, they paint, they even save lives. They break records, they make history and they find friends in the most unfamiliar places. ABCNews.com sees a lot of amazing animals, but here are 11 of our favorites. Even some humans can't do it. But Ujian, a 14-year-old ape at Germany's Heidelberg Zoo, is such an accomplished whistler, he just cut his first CD. He reportedly taught himself how to whistle last summer. "Ich Bin Ujian" ("I Am Ujian") will go on sale at the zoo in June, Germany's Der Spiegel reported earlier this week. The fun, pop-rock song with a bit of a reggae influence, combine's Ujian's whistling with lyrics sung by Tobias Kämmerer. The chorus includes the lines: "I am Ujian the orangutan. I am so cool, man, I'm a star." In the YouTube universe, this bird is a big star. 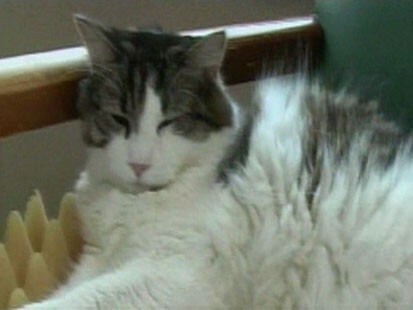 A video of Snowball rocking out to the Backstreet Boys has been viewed more than 2 million times since it was posted in 2007. The video also inspired a first-ever study on how animals "dance" to the music that was published by the journal Current Biology in late April. The article said that the animals shared with people some ability mimic sounds they hear, the Associated Press reported. Call her the Nadya Suleman of the canine world. A super-fertile Florida dog named Dixie gave birth to 20 puppies last week. "It's been around-the-clock feedings" said Dixie's owner, Deanna Stewart. "Because she has so many, she can't do it on her own, so we're having to bottle feed just to make sure they're all rotated and everything's fine with that." Dixie fell just short of the world record, which is 24 puppies. But her owners have their hands full. "It's a hard job. We have to go every three hours and feed them," said Deanna's son, Braxton Stewart. Her work isn't for sale yet, but an African elephant at a British safari park already has more than 50 paintings in her portfolio. Five, a 16-year-old elephant at the West Midland Safari Park in Bewdley, Worcestershire, first demonstrated her penchant for painting when zookeepers left a paintbrush in her enclosure one day, the BBC reported. She picked up the brush and appeared to be painting. Now, when her keeper says, "paint," Five picks up the brush. And she puts it down when she is told, "Okay." A spokeswoman for the safari park told the BBC that Five continues to paint in different colors until she appears satisfied with her masterpiece. In dog years, she's at least a centenarian. In human years, Chanel, the world's oldest dog, is 21. Last Wednesday, she celebrated her 21st birthday, according to Reuters. 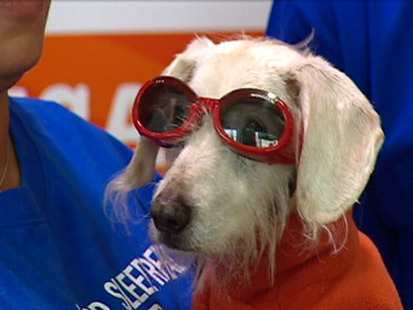 The dachshund, from Port Jefferson, N.Y., received a certificate from Guinness World Records marking the occasion. "Chanel is the Guinness world record holder for the oldest living dog," said Jamie Panas, a spokeswoman for Guinness World Records. The record authority reviewed a veterinarian's certificate, photographs and statements from four witnesses to verify the dog's age. For his knack for knowing when people are about to die, Oscar the cat made it into the New England Journal of Medicine last summer. Officials at the Steere House Nursing and Rehabilitation Center in Rhode Island said the cat curled up next to 25 patients right before they died. The hospital even gave him a plaque for providing compassionate hospice care. This dog can do way more than roll over and shake hands. When Buddy's owner had a seizure, the German shepherd remembered his training and saved his owner's life by calling 911, the Associated Press reported in September. It wasn't the first time Buddy came to the rescue for his owner, Joe Stalnaker, of Phoenix, police said. Buddy has made two other 911 calls when his owner was in trouble. On a recording of the recent 911 call, Buddy can be heard whimpering and barking to the dispatcher. Police were immediately sent to Stalnaker's home. Stalnaker was brought to the hospital and recovered two days later. Officials said police are dispatched whenever 911 is called, but Stalnaker's home was flagged in the system so that police knew a trained assistance dog could call 911 when the owner was in trouble. This uni-flipper wonder is a fighter. Researchers think Allison, a five-year-old green sea turtle, lost her flipper in a shark attack. 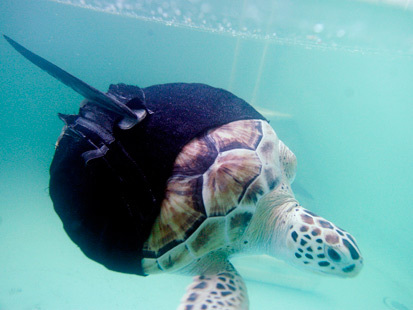 But Sea Turtle Inc., a not-for-profit in South Padre Island, Texas, helped outfit the turtle with a black neoprene suit with a carbon-fiber dorsal fin on the back that allows her to swim with other turtles. Without the attached fin, Allison can only swim in circles. In regular light, they look like any other litter of puppies. But turn out the lights and put them under ultraviolet rays and they'll start to glow red. South Korean scientists say they've used cloning techniques to engineer the world's first transgenic dogs. The four dogs, all named "Ruppy" (a combo of "ruby" and "puppy"), glow red under ultraviolet light, and their nails and abdomens look red to the naked eye. Seoul National University professor Lee Byeong-chun, head of the research team, said the techniques could help develop cures for human diseases. Abandoned by his mother, this wild baby boar was adopted by a German family. But now that Manni has made friends with the family's Jack Russell terrier, he seems to think he's a bit of a pup too. According to Germany's Der Spiegel, the pooch and the piglet are so tight, Manni's learning how to bark. Wilhelm Karl Dahlhaus, the head of Manni's adopted family, told Der Spiegel, "The pair play together every day. They play hide and seek, romp around in the hedges and bushes and just have a lot of fun together." Here's a cat you won't forget. 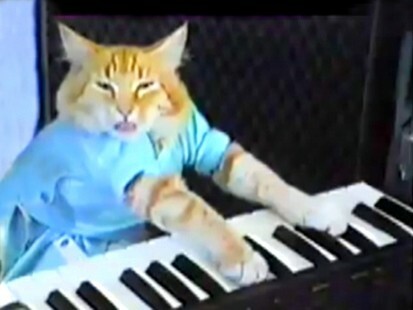 Fatso has been dead for years, but this cat's piano skills are turning him into a posthumous Internet sensation. Even if he might have had some help from human parents, his video is quite impressive.